Early excavations on the Southern side of the amphitheatre in 1909 revealed that the outside wall was nearly 2 metres thick with heavy buttresses. Inside this wall there was an earthen bank which supported the wooden seats. Inside this was the arena wall which was estimated to have originally between 2 and 3 metres high, this surrounded the arena itself. The arena floor was filled in with sand some 50cm deep on top of a layer of river cobbles. The masonry (eg South Entrance top right) was found to be so strong that it was realised that the whole structure could be excavated and left uncovered. Originally the entire arena area had become filled in with earth, creating a flat topped raised surface enclosed by the circumference wall of the amphitheatre. This created a raised round table effect when viewed from above, giving rise to Caerleon's original connection with the Round Table of Arthurian Legend. In 1926, some years after the earlier 1909 excavations, funds were made available by the Daily Mail newspaper and the Loyal Knights of the Round Table of America for a full excavation of the site. 30 thousand tons of soil was excavated, examined and carried away. This at a cost of just under ten pence a ton, considerably less than we would pay today! I wonder where they put all the soil. Also I wonder how it got filled in with so much soil in the first place! 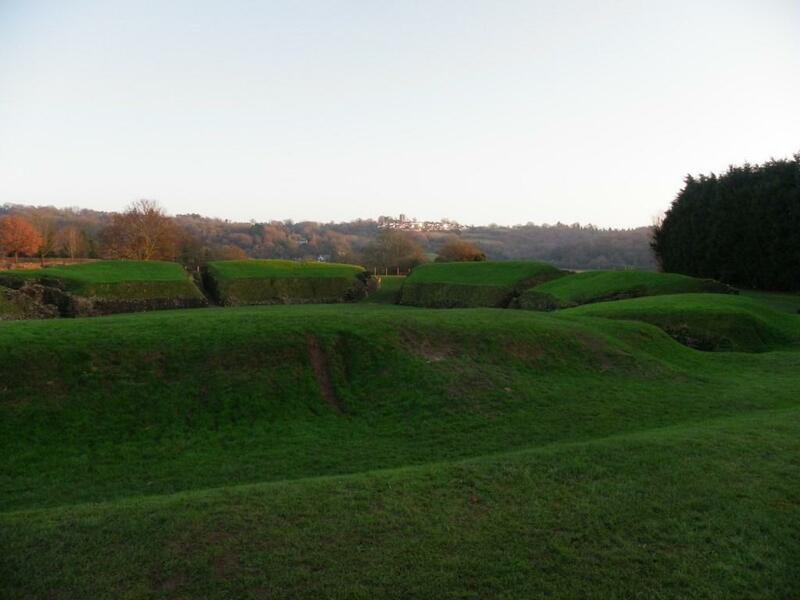 The amphitheatre at Caerleon is one of the best preserved in the World. This makes the site of major historic interest and it is a very good walk for the dogs too. Dogs can walk all around exploring this ancient monument. You can park right beside it. If you go out of the monument area at the far end, opposite where you parked, through a field gate in the left corner of the amphitheatre's enclosed field, you will find a dog walk through some further fields. These are useful if you want to give dogs a good scamper before having them under closer control or on a lead if you prefer, around the monument.